18'' in height, 13'' in width, and 9'' in depth. Cross Shaft fragments, dated to ninth century. This piece of the cross shaft has a standing angel, and the head and shoulder of a figure at the bottom of the fragment. 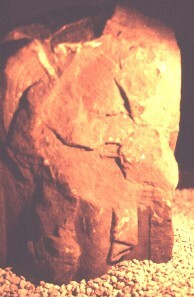 The figure may be kneeling. He is bearded and wearing a cowl, probably a monk. The angel's head is missing.